When an organization presents its history well on its website, we believe that it . 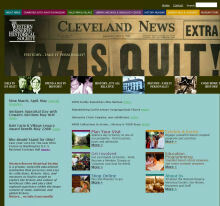 . .
After finding that many websites of Cleveland's Jewish organizations offered little or no content on their history (click here) we looked at the websites of Cleveland's major cultural organizations. In October 2007 we wrote "A few do share their long and distinguished histories on the web, but most say little." In May 2010) we reported on considerable improvement. Mow (in May 2016) we are pleased to tell of further progress. We list the institutions in the order of their year of founding. 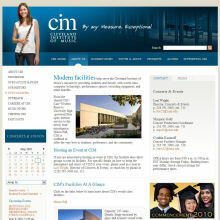 The CMA's website had a dramatic redesign in 2010. It offers essential information plus a large sample of the collection, and is customizable for registered users. 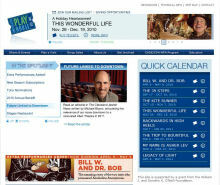 The web site tour will help visitors enjoy the site. User-friendly, but unfriendly to search engines and to wanting to link to interior pages. White on black text is not easy to read. The History page (select "About", then "History and Mission") is generous in its text and supplemented by 20 captioned photos - oddly, unrelated to the text and shown in no logical order. 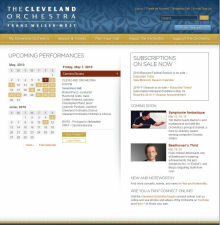 The Cleveland Orchestra is proud of its history. Pictures from its past hang in the Green Room and the nearby halls of Severance Hall. Concert programs have photos of past conductors and the names of past presidents of the Musical Arts Association. But their website's History page is a dull text-only page. Rewritten in October 2009, it has a list of music directors and some on its glorious past. Much of the page is about recent alliances and the current season. But read in conjunction with the Severance Hall page, their history is done well. In our view, with some images, more on their past leaders and on the Blossom Festival, it would be far better. 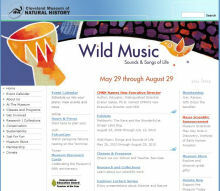 The link to the History page is www.cmnh.org/about-the-museum/history It is presented one page per decade, which has enabled a detailed timeline of growth, discoveries, programs and exhibits. These pages, which would be much richer with images, are text only. In May 2010 we find a crisp new website - though sadly with small fuzzy-looking - Times New Roman - serif font. 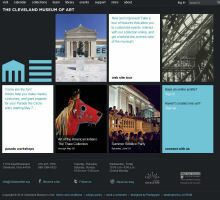 Happily they retained their history pages which in 2007 were perhaps the best virtual history of a Cleveland cultural organization. Click here. Written for their newsletter during their 75th anniversary year (1995-96), they show how print materials can be effectively re-used on the web. Extensive text, many images and due respect shown to those who helped shape the CIM. The pages have been updated since that time and, we are pleased to note, are now up-to-date. Bravo!